The Retro Jr. teardrop from Riverside RV. We’re thinking about downsizing, but this might be a tad too small for all of us. 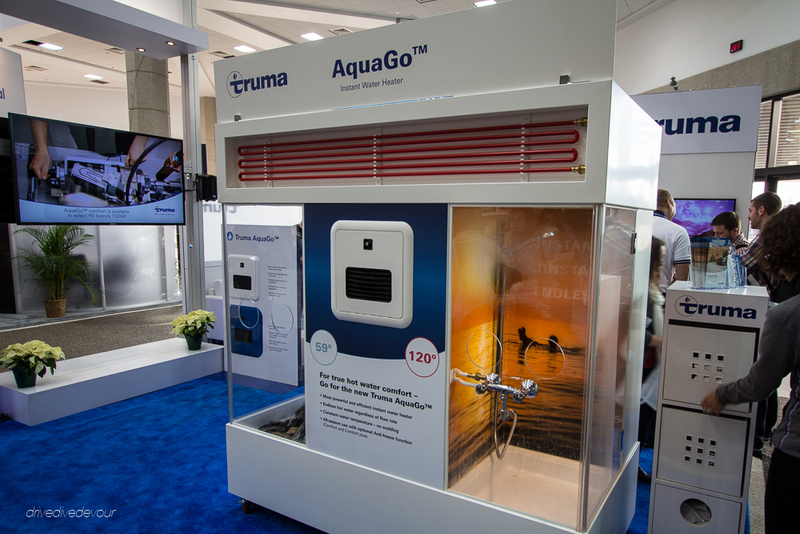 We were lucky enough to attend the industry-only National RV Trade Show this year and picked out the coolest things we saw to share with you. Instead of running through the show like mad people, we mainly focused on items that could be installed aftermarket. If you’re like us, you’re always on the lookout for new, cool products to make life easier. 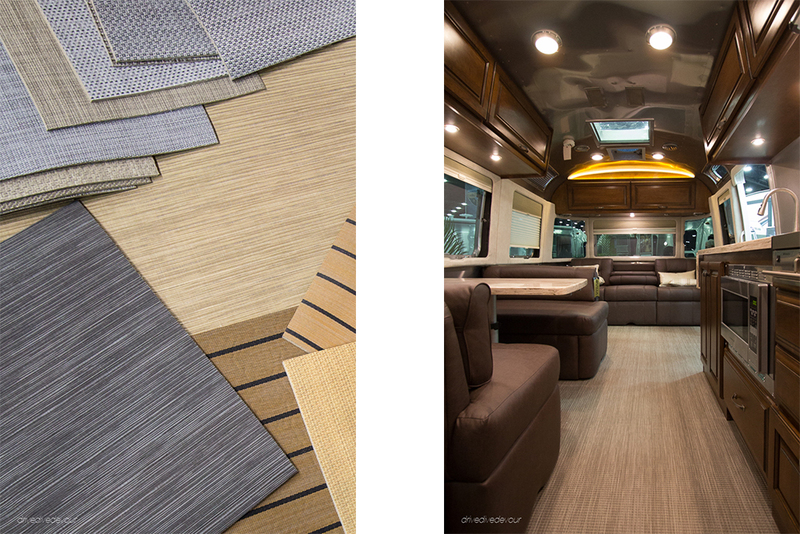 One of the most interesting products we saw making its RV industry debut was woven vinyl carpets from Infinity Fabrics. The flooring has been used on boats for about two years now and has just started making its way into RVs. We were even able to see it in the new Airstream Classic featured at the show. The carpet is anti-microbial, anti-bacterial, stain and fade resistant, and is 100% recyclable. They had a convincing video playing in their booth of various messes like muddy shoes and smeared ketchup being cleaned up easily with paper towels and water, impressive. The woven fabric also holds up well to pets, something important to us. We don’t care for most traditional carpets in RVs, but the dogs tend to slide on our hard flooring. We think they would enjoy the traction of the woven texture. The flooring is offered in 10 styles with over 75 colors total. It can be used to carpet the whole RV or made into custom cut and bound rugs. Check out all the colors and more at Infinity Fabrics. Truma got in the holiday spirit changing their booth into a Christkindlmarkt. We’re all for saving water, but having two showers back to back all while washing dishes? That sounds like a little piece of heaven. Well, except for actually having to wash the dishes. Get more info at Truma. 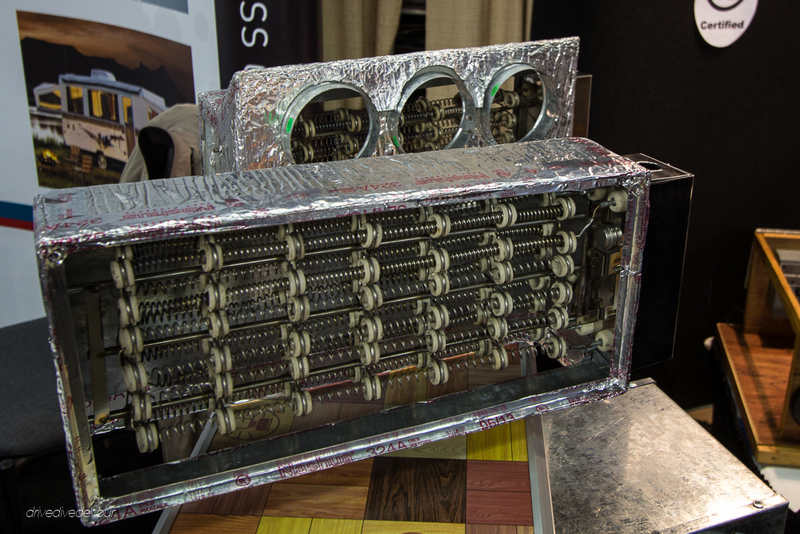 The CheapHeat system by RV Comfort Systems allows you to add a forced air electric heating element into your current gas furnace. With a flip of a switch, you can choose to use your propane or the campground’s electricity to heat your furnace. What’s nice is that you don’t have to change out your entire system; you just add a piece on to your current furnace. Install time is about 6-7 hours for a certified RV service, so it can get a little pricy. If you’ve wanted an electric option, though, it’s worth a look. For a closer view, check out RV Comfort Systems. We saw a new drying rack called Extend-A-Line that attaches to the back ladder quickly and easily and can hold 10 lbs on each arm. It will also include a wall mount for RVs without a ladder or in the home. We’re thinking this could be pretty handy after beach time or diving. Their miniature display was pretty cute, too! See more at Stromberg Carlson. Although not an upgrade to your RV, these can definitely upgrade your life! These Blowfish iSUPs from Fisher Boards start out small enough to store in a bay or back of your car and then inflate to full size stand up paddleboards. They’re military grade construction with kevlar reinforced sides and feel thick and sturdy. We were even able to try them out with our friends the Snowmads! Brandon is already trying to devise how he could modify one to carry scuba tanks. Jump in at Fisher Boards. We saw a few versions of this LED tube lighting. The manufacturers are taking the existing led strip light that we all know and molding into tubes in order to diffuse the light to create a nice glow. We like that it helps diffuse the bright LEDs that can blind neighbors and that it looks like a neon sign! The tube lights can still be cut and bent like the strip lights and flush mount indoors or out. A LED light strip in the roller tube of awnings has become a new feature across many brands and is cool itself, but what could make it even better? How about adding a “PowerChannel” to the roller tube letting you slide in and power fans, lights, and speakers without wires? This could make enjoying the patio even more fun and clutter free. This new idea is from Dometic. So maybe you want to upgrade your whole RV instead of just a part. Well the same people who make some of the most impressive beasts on the road now bring us a smaller version of their luxurious style. Renegade RV is known for its custom luxury coaches and specialty vehicles built for a host of industries. They debuted their new Class C Villagio last year and this was our first chance to see it in person. The motorhomes are built on sprinter chassis and have some of the nicest design touches we’ve seen like a drawer custom-built for dining trays and curved cabinetry. Brandon was excited to see the valve extenders on the tires knowing this meant they thought things through from an owner’s perspective. The paint scheme features a more subdued swoop, nothing over the top. And did we mention they’re certified green! See more at Renegade RV. We had to make our way over to Winnebago to check out the new Brave. While there, we spotted the winner in the “Biggest Misnomer” category. The motorhome was painted all black with matte black stripes (matte actually being a cool idea), and purple touches. The motorhome name … Solei by Itasca. If this motorhome was named after the sun (a variation on soileil? ), it definitely doesn’t radiate a sunny glow and would surely be baking in the sun. If was named after a leg muscle (solei) … well, than that’s a bit odd anyway. Either way we’ve had enough with all the overly dark RVs, let’s get back to some moderation in color schemes that aren’t hotboxes. Join our Free Facebook Community! Bring your questions and find your answers.